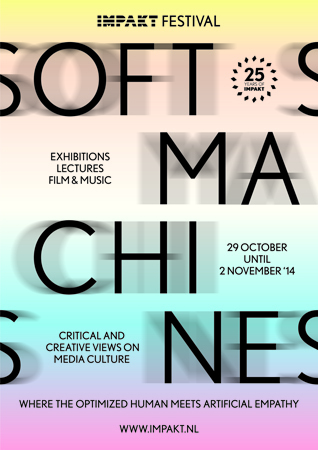 The 25th edition of the Impakt festival, Soft Machines, takes place at the intersection of affect and machines. The concept of empathy becomes both content and form through lectures, performances, screenings, and an exhibition. Here, technology adopts the ethical and emotional burdens of humans and our own emotional world is reshaped by the demands of technology. Machines turned soft, and soft flesh codified into machines. In turn, this crossing of paths defines the structure of the festival itself: an interdisciplinary moment for visual artists, scientists, scholars, and musicians to come together and share with each other and the public. From this comes a new diagram for understanding how technology changes our lives: not the straight line of “progress” but the figure of the X, describing both a convergence and a short-circuit, equal promises of exchange and confrontation. Though much of the work of artificial empathy still lies in the future, we already know that there is no single kind of affective bridge being built between humans and technology and that their emerging forms are both stranger and more pervasive than we expected. And so, as much as Soft Machines necessarily points towards work not yet done or only just begun, speculations on the future are also crossed by a critical line that moves in the opposite direction through the present and the past; the field’s early moments full of ethical problems, disappointments, and outright failures become opportunities for revealing our own aspirations, fears, and ideologies. In this way, by moving towards an understanding of what it means for a machine to feel, we find ourselves doubled-back upon the course of self-understanding instead, borne by the route of the X back to a redefined sense of what it means to feel human. Impakt presents critical and creative views on media culture. The organization runs a residency program, events, an online channel and the annual festival—celebrating the 25th edition in 2014. In addition to the curated program Soft Machines, the festival hosts an overview of recent film, video and media art within the Panorama Program. Professional visitors can request accreditation via impakt.nl/accreditation.